Hire the RX500 air scrubber capable of cleaning up to 850 Meters of air per hour. 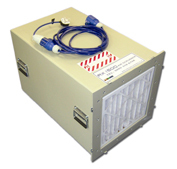 With user-friendly and versatile features, the RX 500 Air Scrubber is ideal for handling indoor air quality needs on every restoration job. Any job that involves sewage, mould, or fire damage clearly involves significant amounts of particulates and smelly gasses a direct result of the damage itself.